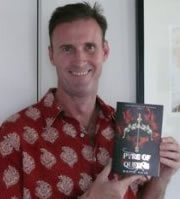 David Hair is the author of The Bone Tiki, winner of Best First Novel (Young Adult Fiction section) at the 2010 NZ Post Children’s Book Awards. The Bone Tiki and its sequel The Taniwha’s Tear are fantasy novels set in New Zealand. David is a New Zealander, who has worked primarily in financial services. He has a degree in History and Classical Studies. He has lived from 2007 to 2010 in New Delhi, India, but usually resides in Wellington, New Zealand. Apart from writing, he is interested in folklore, history, and has a passion for football. CLICK HERE FOR MORE BOOKS BY DAVID HAIR. 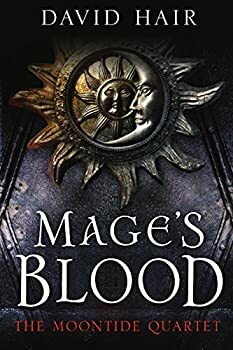 Mage’s Blood, by David Hair, is a sprawling epic clash of civilizations that will seem familiar to those who know their history and world cultures, though the addition of magic and some geographic repositioning keeps it from being simply historical fantasy or fully allegorical. The Scarlet Tides is David Hair’s second book in THE MOONTIDE QUARTET series, picking up pretty closely after book one, Mage’s Blood, which I gave a 3.5 to last year. 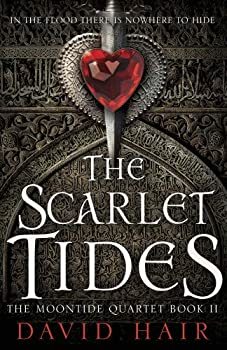 The Scarlet Tides has many of the same strengths as Mage’s Blood, and fewer of the problem (though still a few), which is why I’m giving it four stars. As a quick recap, I’m going to paste in a condensed and slightly updated copy of my setting/character summaries from that first review. Warning: the summary will include a few spoilers from book one.